Beautiful lawns are not a product of nature, but are planned and created. Lawn fertilizer will always be an important part of the creation process. Choosing the right lawn fertilizer begins by knowing what nutrients are currently in your soil, as determined by a soil test. Lawns that are not fertilized will have to rely completely on what is in the soil for all their nutrients. The soil around most homes these days, as you probably know, is not that good. After a house is built, contractors rarely consider the quality of the soil as anything important. As long as the lot is graded properly, that is all that matters. Lawn grasses need several micronutrients and macronutrients to stay healthy and to perform necessary plant functions. The list of micronutrients include Boron (B), Clorine (Cl), Copper (Cu), Iron (Fe), Manganese (Mn), Molybdenum (Mo), Nickel (Ni and Zinc (Zn). These are also referred to as trace elements. Most of the micronutrients, with the exception of iron, are usually not included in a bag of lawn fertilizer. The primary macronutrients are Nitrogen (N), Phosphorus (P), and Potassium (K) and represent the most commonly used ingredients in lawn fertilizer. These three nutrients are very important for plant function and are the elements most deficient in soils. Other macronutrients include Calcium (Ca), Carbon (C), Hydrogen (H), Magnesium (Mg), Oxygen (O), and sulfur (S). Have you ever thought about what is in fertilizer? The three numbers on a fertilizer bag represent the three primary macronutrients, which are Nitrogen, Phosphorus, and Potassium, in that order. More specifically, the numbers represent the percentage by weight that the bag contains of each element. Note: Fertilizer manufacturers do a poor job explaining to consumers how to interpret the numbers on the bag. Many people think the numbers represent a ratio of some sort or that it has that many pounds of ingredient in the bag. Again, it is neither of these, but the percentage by weight of each ingredient. For example, if the bag weighs 25 lbs and first number on the bag (Nitrogen) is 10, then the bag contains 2.5lbs of Nitrogen. If the bag weighs 30 lbs and the first number is 20, then the bag would contain 6lbs of Nitrogen. Click on the Calculating Fertilizer Rates page to see simple mathematical formulas used by the turf industry. Using these formulas will give you the amount of ingredient actually in the bag. You can also calculate how much fertilizer you need to apply for different situations. This is important because fertilizer programs are determined by lbs of Nitrogen per 1000 sq. ft. per year. If you know how much Nitrogen is actually in the bag and your spreader is calibrated correctly, you can accurately plan your entire fertilization schedule for the year regardless of what the bag tells you to put down. Synthetic fertilizers are the most often used types and come in liquid and granular forms. 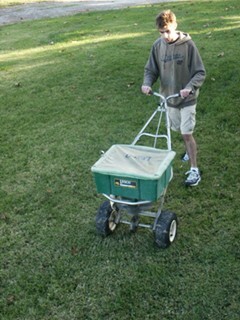 Granular fertilizers are the easiest to apply and require the least expensive equipment. All that is needed is a rotary or drop spreader. Liquid lawn fertilizer, except for the small hose end types like “Miracle Gro”, may require special equipment to apply. Most liquid fertilizers are reserved for professional companies. As far as which one is best, for the most part, they both perform equally well. 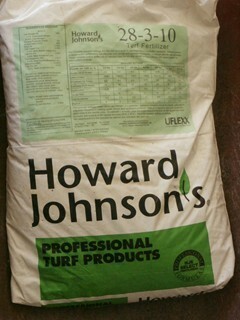 This Howard Johnson's fertilizer is sold only to licensed professionals, but many home owner varieties are available. The effects of fertilizers on the environment, when used on turfgrass, is not as big a concern as people once thought. Click here for more information on fertilizers and the environment. However, not all fertilizers are created equally. Some are referred to as “all mineral”, which means all elements are released at the same time as soon as water is applied. These are usually the least expensive and you can still purchase a 50lb bag for under $10.00 at some feed stores. These bags often contain no instructions for storage or safe use nor any information on how much to apply. A note on the bag says you will need to write to the company for that information. Due to the high salt content, they must be used carefully and watered in thoroughly after use to prevent any possible burning of the grass. These fertilizers do serve a good purpose for specific situations, but for most homeowners, better and safer lawn fertilizer is available. More expensive fertilizers will contain higher quality ingredients and often more than one form of available nitrogen. Usually, at least one form of nitrogen in the bag will be slow release. By blending different ingredients with different release rates, they can be marketed as “spring”, “summer”, and “fall” or “winterizer” fertilizers. Click here for information on different sources of nitrogen along with the best ways of using them. Organic fertilizers will naturally contain a larger array of micronutrients and can be purchased in different forms. “Certified Organic” means the lawn fertilizer is “all natural” and contains no synthetic materials. However, it doesn't mean it is not processed. (Who really wants raw manure, anyway.) These products fertilize the grass slowly as the soil microorganisms break down the organic matter into elements the grass roots can take up. Organic lawn fertilizer is safe and, because of the way it works, makes it difficult to over fertilize. Organic fertilizers available for turf use range from sewage based materials such as Milorganite, animal by products, such as manure, and plant by products, such as corn gluten meal. There are probably close to 25 organic products that I can think of for lawn use. Some provide better results than others. Bridge products are organic fertilizers blended with synthetics. Depending on the blend of lawn fertilizer you choose, some will contain as much as 90% organic matter and are blended to perform best for different times of the year. Soil microorganisms are the least active in cold weather and most active in summer, so summer blends will contain the highest amounts of organic matter. The synthetics blended with the organics will provide the grass with immediate nutrients in cooler weather. 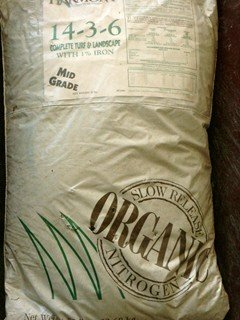 Before you buy your first bag of fertilizer and start your fertilization program, it really helps to find out what is in your soil so you can correct any potential problems. Look below for links on how to take a soil sample and detailed information on how to read a soil analysis report. You can also find specific information on fertilization, lawn fertilizers and how to apply them.